Seventeen months after the fraudulent June 12, 2009 presidential election, which threw the Islamic Republic into its worst political crisis since the 1979 revolution, and five months into the latest round of international sanctions against Iran, Ayatollah Ali Khamene'i is desperate to demonstrate that he is the legitimate supreme authority in Iran. Should the Revolutionary Guards, the engine of Iran's nuclear and missile program, begin to feel the full weight of the sanctions with the government unable to compensate it with its long-held financial and economic privileges, Ahmadinejad may end up being universally seen as the culprit of Iran's defiant policies. The ayatollah's October 19, 2010 visit to the holy city of Qom, Iran's equivalent of Vatican City, illustrates the point. Traditionally, the Islamic Republic's official propaganda has depicted the Iranian head of state as a religious scholar or a Platonic philosopher king. Grand Ayatollah Ruhollah Khomeini, the republic's founding father, for example, spoke modestly of himself as a "theological student" (talabeh). But not so Khamene'i, whose visit to Qom was staged as a triumphant general's march into a conquered city, which recently mourned the passing of dissident Grand Ayatollah Hossein-Ali Montazeri. Qom was conquered by a man who wears the Basij militia's signature Palestinian scarf over his clerical robe, signifying greater affinity with ideological military organizations such as the Islamic Revolutionary Guards Corps (IRGC) and the Basij than with traditional theological centers of learning, which have never recognized his academic qualifications. Even the sycophants described the visit as "a divine war game" and a "rehearsal of the welcoming of the Imam of the Era [the Shiite messiah whose emergence starts Apocalypse] by the pious." Addressing the masses in Qom, Khamene'i did not speak the language of a theologian but that of a military commander. He called Qom a city of holy struggle (jihad)—a reference to Khomeini's June 5, 1963 speech in Qom that marked his revolt against the shah's regime—and warned the public against "the enemy" twenty-seven times in a speech that lasted only forty-two minutes and four seconds. Khamene'i also stressed that the "sedition of 2009 [i.e., the post-election crisis] vaccinated the people against the political and social microbes" and assured the audience that the international sanctions would, "God's willing, not have a significant effect upon the life of the people." Khamene'i's crude language and reference to "microbes" was meant to intimidate his political opponents and demonstrate his self confidence, which may not be entirely baseless. By severely restricting the physical movement of the reformist Green Movement's leaders and imprisoning their lieutenants, Khamene'i has successfully managed to contain the opposition. Having repressed the freedom seekers, Khamene'i is carefully preparing the suppression of the impoverished public that demands bread as the sanctions take their toll on Iran's economy. Appearances, however, are often deceptive, and the cracks in the facade of Khamene'i's Potemkin village keep growing. The very instruments of force that have enabled him to suppress the domestic opposition and contain protests against the effects of international sanctions may pose the greatest challenges to his rule. Excessive reliance on the use of force, alienation of the so called reformist camp, which earlier constituted half of the Islamic Republic's political elites, and especially his overreliance on President Mahmoud Ahmadinejad, have left the supreme leader at the mercy of former and current members of the IRGC and the Basij, who in turn have become power brokers in their own right and no longer consider themselves subservient to Khamene'i. The troubled relationship between Khamene'i and Ahmadinejad, a former member of the IRGC, is a case in point. During Khamene'i's visit to Qom, both vied to dominate the Iranian press. On the day of the supreme leader's much celebrated visit, Ahmadinejad attempted to overshadow his superior by depositing $81 into the bank accounts of 1.8 million households in the three provinces of North, South, and Razavi Khorasan. Although the government had long promised a reform of public subsidies, by announcing the promised cash transfer on the day of Khamene'i's visit, Ahmadinejad won an important publicity coup. Interestingly, Ahmadinejad also hosted Venezuelan president Hugo Chavez—on his ninth visit to Iran—on the day of Khamene'i's visit to Qom. The Iranian Foreign Ministry even announced that Ahmadinejad and Chavez would meet Khamene'i in Qom. The announced meeting never materialized, possibly because of Khamene'i's realistic fear that the presidents would steal the stage in the holy city. Speculations about Iran's purchase of Russian-made S-300 air defense systems, in which the Chavez government acted as middleman, would also have caused additional embarrassment to Khamene'i, who had often stressed the Islamic Republic's self-sufficiency in military industries. Four days into the Qom visit, the ayatollah faced another challenge: Ahmadinejad's chief of staff, Esfandiar Rahim-Mashaei. Addressing the Farabi International Seminar on October 23, 2010, Mashaei stressed that he had nothing against translation of Western literature for humanities curricula at Iranian universities. This statement was in direct contradiction to a position take by Khamene'i, who in a major speech accused the humanities of laying the intellectual foundations for the post-election crisis in Iran and demanded a purge of Western literature. There is a long history of enmity between Khamene'i and Mashaei. Upon his contested reelection in 2009, Ahmadinejad appointed his old comrade Mashaei, who is also his daughter-in-law's father, first vice president. Due to Mashaei's history of making controversial statements, such as "the era of sovereignty of religion is over," and "the people of Israel are our friends," Khamene'i wrote a handwritten note to Ahmadinejad demanding Mashaei's dismissal. The president ignored Khamene'i's order for an entire week, and in the end appointed, Mashaei his chief of staff. It is against this background that Mashaei's recent statements must be seen. Ahmadinejad's attacks against Khamene'i's ideological agenda continued on the fifth day of the Qom visit. Addressing the "soft warfare" seminar at Tehran University, the president spoke of "Iranian Islam," an issue that had previously been addressed by Mashaei. In the Iranian political context, Ahmadinejad and Mashaei's discourse is a nationalist rhetoric that challenges the internationalist aspirations of the Islamic Republic, which call for mobilization and unification of the entire umma (worldwide Islamic community) without regard to modern, political borders. The struggle for power and prestige between Khamene'i and Ahmadinejad illustrates how dangerous it is for the supreme leader to rely solely on one elite group while alienating the reformist camp, which might have maintained the balance among Iran's ruling elites. Khamene'i is aware of the problems he faces, and most of his moves betray his anxiety to restore the balance within the regime. While remaining silent himself, Khamene'i has systematically supported the parliament and the judiciary—headed by brothers Ali and Sadegh Larijani—in their attacks against the Ahmadinejad government. Parliamentary resistance to Ahmadinejad's economic reform scheme—manifested in a prolonged approval process for the national budget—as well as criticism by parliament of the Ahmadinejad government's haphazard law enforcement, notably its refusal to allow judicial investigation into alleged governmental mismanagement, led to the establishment of a working group for conflict resolution between the parliament and the government. However, expectations for the group's ultimate success remain modest. In the words of Abbas-Ali Kadkhodayi, a Guardian Council member, "We must only pray for the enactment of the law. We can't do anything else, because we have no other legal obligations." Khamene'i's actions against Ahmadinejad, however, include more than prayers. The Office of the Supreme Leader has also mobilized Friday prayer leaders to slander the president on a wide range of issues, including Ahmadinejad's call for relaxation of the Islamic hijab (headscarf) requirements for women, his failure to enact the laws passed by parliament, and his interviews during his last trip to attend the United Nations General Assembly. Most importantly, Khamene'i himself has recently broken his silence by criticizing the Ahmadinejad government's poor performance in securing social justice and in establishing parallel policymaking institutions. In another attack against Ahmadinejad, the November 1, 2010 issue of Payam-e Enghelab, a monthly IRGC publication issued by the Office of the Representative of the Supreme Leader to the Revolutionary Guards, criticized Ahmadinejad's month-old statements about the executive branch being superior to the legislative power, backed up the parliament's complains about the cabinet not enacting laws passed by the parliament, and slammed Ahmadinejad's use of "Persianism" rather than "Islamism" as the ideological discourse of the government. Khamene'i's balancing act, however, seems somewhat halfhearted. One example is Khamene'i's position in the struggle between the government and former president Ali-Akbar Hashemi Rafsanjani for control of Azad University, Iran's largest institution of higher learning. During the presidential elections, Rafsanjani used the university to provide funding for Ahmadinejad's presidential rivals Mir-Hossein Mousavi, Mehdi Karrubi, and Mohsen Rezai with local branches of the university used as de facto election headquarters for anti-Ahmadinejad candidates. From a purely opportunistic point of view, Khamene'i should have taken the side of Rafsanjani, whose power and prestige had been in free fall for some time; yet he chose to support Ahmadinejad's attempt to nationalize Azad University. Khamene'i's vindictiveness toward Rafsanjani prevented him from making the rational, pragmatic move to counterbalance Ahmadinejad. On the whole, Khamene'i's balancing act does not seem to work as Ahmadinejad's civilian critics are disunited and weak, and the Revolutionary Guards, which are handsomely rewarded for their support of the regime in general and Ahmadinejad in particular, have little incentive to oppose the president. It is too early to assess the impact of the international sanctions regime on Iran, but inter-factional disputes among different elite groups keep growing as the sanctions bite deeper into the Iranian economy. While Ahmadinejad, his cabinet ministers, and the government's allies stubbornly insist that Iran's economy has not been affected by the sanctions, Khamene'i is increasingly talking about the necessity to prepare for the sanctions' adverse effects on Iranian society and economy. 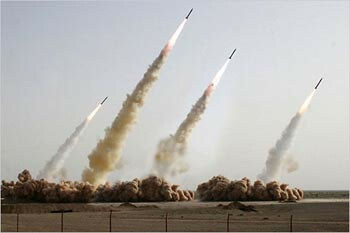 Although Ahmadinejad's hard stance on the nuclear issue may reflect the pressure exerted on him by the Revolutionary Guards, the engine of Iran's nuclear program, and possibly by Khamene'i, he may well end up being universally seen as the culprit of Iran's unwise policies, the attendant sanctions, and diplomatic isolation. This scenario is especially likely when the IRGC begins to feel the full weight of the sanctions with the government unable to compensate it with its long-held financial and economic privileges. Khamene'i could have avoided this looming crisis had he not disturbed the delicate balance between the country's elite groups by predicating his power base on the IRGC, the Basij, and former IRGC commanders such as Ahmadinejad. Alas, political foresight is a quality that all too often eludes supreme leaders. U.N. News Service (New York), June 9, 2010. Mohammad Pour-Gholami: "Man Yek Talebeh-am, Tashrifat Ra Kam Konid," Markaz-e Asnad-e Enghelab-e Eslami website (Tehran), Feb. 10, 2010. Kaleme (Tehran), Dec. 21, 2009; see also "An Ayatollah Condemns an Unjust Ruler," Middle East Quarterly, Spring 2010, pp. 73-6. Hawzeh News (Qom), Oct. 18, 2010. "Bayanat dar Didar-e Omoumi Ba Mardom-e Qom," Daftar-e Hefz va Nashr-e Asar-e Hazrat-e Ayatollah al-Ozma Khamene'i website (Tehran), Oct. 19, 2010. "Bayanat dar Ejtema-e Bozorg-e Mardom-e Qom," Daftar-e Hefz va Nashr-e Asar-e Hazrat-e Ayatollah al-Ozma Khamene'i website, Oct. 19, 2010. BBC Persian (London), Aug. 31, 2010. Iranian Student News Agency (ISNA, Tehran), Oct. 12, 2010. Borna News Agency (Tehran), Oct. 19, 2010. Mehr News Agency (Tehran), Oct. 16, 2010. Asr-e Iran (Tehran), Oct. 19, 2010. Ali Vadae, "Bara-ye S-300-ha Hagh-e Dalali Napardazim," Mardomsalari (Tehran), Oct. 19, 2010. Kayhan (Tehran), Feb. 23, 2010. Tehran-e Emrooz (Tehran), Oct. 24, 2010. "Didar-e Jam-i Az Asatid Va Aza-ye Heyat-e Elmi, Nokhbegan Va Rouasa-ye Daneshgah-ha Va Marakez-e Tahghighati," Paygah-e Ettelae-resani-ye Daftar-e Magham-e Rahbari website (Tehran), Aug. 30, 2009. Mehr News Agency, July 18, 2009. Alef News Agency (Tehran), July 19, 2008. "Nameh-ye Rahbar-e Moazam-e Enghelab Be Reis-Jomhour Dar Mored-e Agha-ye Mashaei," Daftar-e Hefz Va Nashr-e Asar-e Hazrat-e Ayatollah Al-Ozma Khamene'i website, July 18, 2009. "Esfandiar Rahim-Mashaei Moshaver va Reis-Daftar-e Reis-Jomhour Shoad," Paygah-e Ettela-e-Resani-ye Dowlat website (Tehran), July 25, 2009; see, also, Reza Molavi and K. Luisa Gandolfo, "Who Rules Iran?" Middle East Quarterly, Winter 2010, pp. 61-8. Fars News Agency (Tehran), Oct. 25, 2010. Aftab News Agency (Tehran), Aug. 4, 2010. Hamshahri (Tehran), Aug. 28, 2010. Tabnak News Agency (Tehran), June 19, 2010. Khabar Online (Tehran), Aug. 14, 2010. Alborz News (Tehran), Aug. 14, 2010. "Didar-e Reis-Jomhour Va Heiat-e Dowlat Ba Rahbar-e Moazam-e Enghelab-e Eslami," Daftar-e Hefz Va Nashr-e Asar-e Hazrat-e Ayatollah Al-Ozma Khamene'i website, Aug. 30, 2010. BBC Persian, Nov. 1, 2010. Al-Arabya News Channel (Dubai), Oct. 17, 2010. Fars News Agency, Oct. 11, 2010. Ali Alfoneh, "The Revolutionary Guards' Looting of Iran's Economy," Middle East Outlook, June 2010. "Bayanat dar Ejtema-e Bozorg-e Mardom Qom." Related Topics: Iran | Ali Alfoneh | Winter 2011 MEQ receive the latest by email: subscribe to the free mef mailing list This text may be reposted or forwarded so long as it is presented as an integral whole with complete and accurate information provided about its author, date, place of publication, and original URL.